Khmer rulers based at Angkor (9th-15th c CE) competed to control one of the largest and longest-lived of the pre modern agrarian polities of mainland Southeast Asia. Angkor is best known for the monuments, hydraulic works and transportation systems around its urban core. As yet, however, we understand little of how the Angkorian elite exerted political and economic control over their broader territory. This project aims to reconstruct the wider core-hinterland relationships using stoneware production and exchange as a proxy for political expansion and contraction. In order to track the dynamics of stoneware production and exchange, we are undertaking a large scale program of provenancing and dating of Khmer stoneware kilns. This provides the structure for understanding where and when Khmer stonewares were produced. We are also sampling stonewares from habitation sites, to evaluate the geographical range of stoneware exchange across the Khmer empire from different production centers – as well as how consumption varied over time with the cyclical changes in Khmer hegemony. 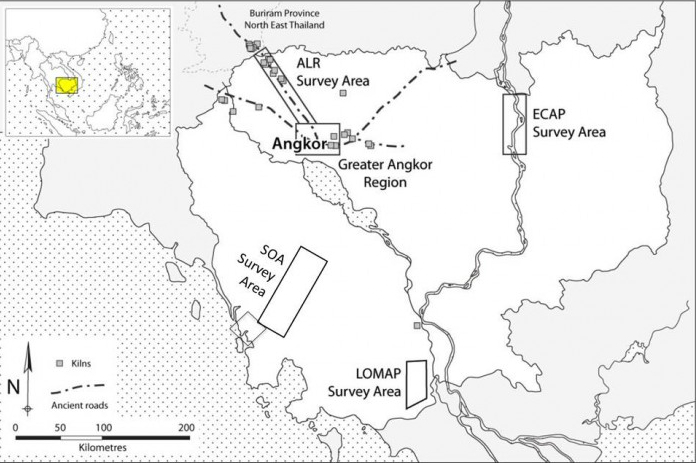 establish the geochemical “fingerprint” for each of the Angkorian-period stoneware kiln complexes using Neutron Activation Analysis. identify the scale and extent of distribution systems for these stonewares. produce a chronologically controlled sequence for geochemically provenanced ceramics through a program of dating specific kiln complexes (OSL, AMS radiocarbon and a relatively new technique RHX). This will enable us to identify changes in the patterns of distribution and interaction over time.